Myanmar, formerly called Burma, is a basin and delta of the Irrawaddy River ringed by a horseshoe of high mountains that isolates the country from India, China, and Thailand. Britain conquered Myanmar over a period of 62 years (1824-1826) and incorporated it into its Indian empire.It became a separate, self-governing colony in 1937. Independence from the Commonwealth was attained in 1948. 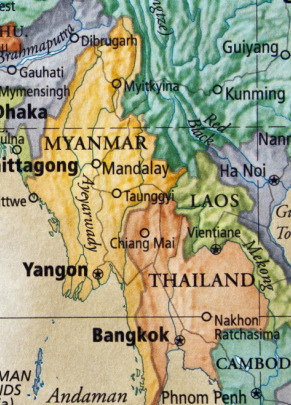 Myanmar is a resource-rich country, but the country suffers from pervasive government controls, inefficient economic policies, corruption, and rural poverty.Formerly a socialist republic, nominal civilian parliamentary government took power in March 2011. The estimated population in July 2012 was 55 million. Of that number, 90% are literate and 32.7% live below the poverty line.Burmese is the official language but there are 115 others. Buddhism is the major religion, but there are Muslims and evangelical Christians as well. Most Christians are from the minority ethnic groups such as Chin, Karen, Lisu, Kachin, and Lahu. There are 142 people groups, 36% of whom remainunreached.Many Christians are well-educated but cannot rise to positions ofresponsibility due to religious prosecution. Myanmar is a deeply fractured nation on a political, ecclesiological, and especially, on an ethnic level. Yet the church in Myanmar has become a vibrant missionary sending movement, despite financial limitations and geographic isolation. The continued growth of the church amid great suffering and repression is an answer to prayer. The majority of believers still come from certain ethnic minorities, but there is an increasing response from the Buddhist majority, particularly monks. Momentum in evangelism is building as an indigenous missions movement begins to flourish.